A cataract is simply a clouding of the normally clear lens of the eye. This is a normal part of the aging process, but may also result from an injury or as a complication from another medical condition. About half of all Americans 65 to 74 years old have cataracts, and about 70% over the age of 75 have them. Most people with cataracts have them in both eyes although they may develop at different rates. 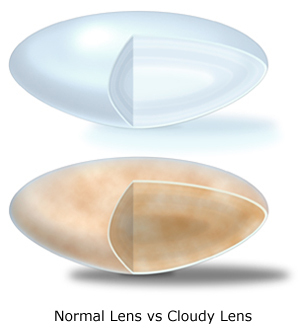 As the lens becomes more opaque, it interferes with the passage of light through the eye resulting in impaired vision. Cataract symptoms include fading of colors, particularly the inability to see blues and purples, blurred vision, cloudiness, halos around lights, reduced vision in bright light, double vision in one eye, need for brighter light when reading, poor night vision, and frequent eyeglass prescription changes. A popular misconception is that a cataract can be removed with eye drops. Surgery remains the only way to remove a cataract. Initially, changes in your eyeglass prescription will suffice to improve your vision, but as the cataract continues to progress, this will no longer be effective. Eventually, surgical removal is the only alternative. Cataract removal is recommended when your reduced level of vision interferes with your lifestyle and normal daily activities. Most people have the surgery as an outpatient procedure. Our state of the art surgery center, Atlantic Surgery and Laser Center, is well suited to provide this service. Under an operating microscope, a small incision is made in the eye. A special instrument uses ultrasonic vibrations to break up the lens into small pieces, which are then suctioned out of the eye. A plastic artificial lens is placed in the eye to replace the natural lens that was removed. This procedure takes about 15 minutes and is painless. Pain following surgery is rare and is generally limited to a mild scratchy feeling or light sensitivity for a few days. Over 95% of cataract surgeries improve the patient’s vision, and a complete routine eye exam is all that is needed to diagnose cataracts.